Move over Tabbies… E-Stickers are here! Now you can easily add digital exhibit stickers directly to your Adobe PDF exhibits with the click of a button. Our powerful auto-incrementing and auto-numbering feature sequentially numbers/letters your E-Sticker for you as you place each stamp. It even remembers the next number you need to begin with. Our NEW “Use File Name” feature automatically uses the document name as the exhibit sticker number if your documents are already named by exhibit number. We also have a powerful batcher function (by request), that will let you exhibit sticker a folder full of documents automatically. The E-Sticker converts a job that used to take hours into just minutes. Be less busy and more billable. We call our E-Stickers “All-In-One” because with these E-Stickers, your choices are almost limitless. Every E-Sticker is customizable with a choice of 10 colors, custom title, prefix and the ability to set a starting number/letter. The E-Sticker will automatically sequentially number/letter your stamps as you place them. It even remembers where you left off, for the next time you need to stamp an exhibit. Or, you can use the new “Use File Name” feature if your documents are already named according to your exhibit numbers. Styles 2-4 have an additional field for use, either a header, sub-title or footer, respectively. These are perfect for adding Cause Number, Date, Deponant…you name it! 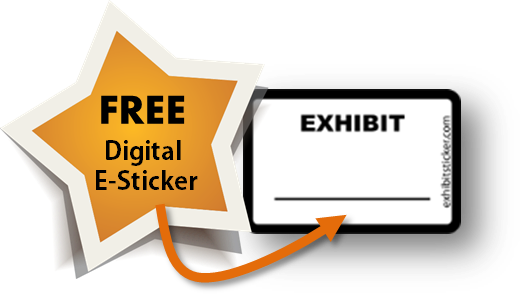 Click below to get your free digital white “Exhibit” E-Sticker. It has the same manual entry feature that all of our stickers have and is 100% fully functional. It’s super easy to use and there’s no expiration…use it as long as you like. Why not give it a try today? Once you give it a whirl, come back and check out all the additional features of the paid version such as complete customization of colors and text and autoincrementing numbering and lettering. We’ve added a few new features to the All-In-One, including the ability to increment by letters, manually enter any combination of letter/numbers or special characters and 4 new colors! The E-Sticker is a plug-in specifically created to add electronic exhibit stickers to your PDF files directly within Adobe Acrobat. It works with Adobe Acrobat versions X, XI & DC (2015, 2017, 2019) and also the Acrobat Free Reader (version X or higher). Not have to upload to an online service that requires you to send in your case sensitive documents and charges by the piece (saving you money and keeping case files safe and sound). Have basically no learning curve, you are using a program you are already familiar with – the E-Sticker plug-in requires no new software to install. Save money. One time cost and unlimited E-Stickering with each license. Save time you could use preparing for your case. Easily sticker hundreds of documents in minutes. If you are a Nuance, Nitro or other third party PDF user, no problem. Simply work with your PDFs in your program of choice and when you are ready to add exhibit labels, open your PDFs with the free Adobe Acrobat Reader XI, select your E-Sticker and stamp away. 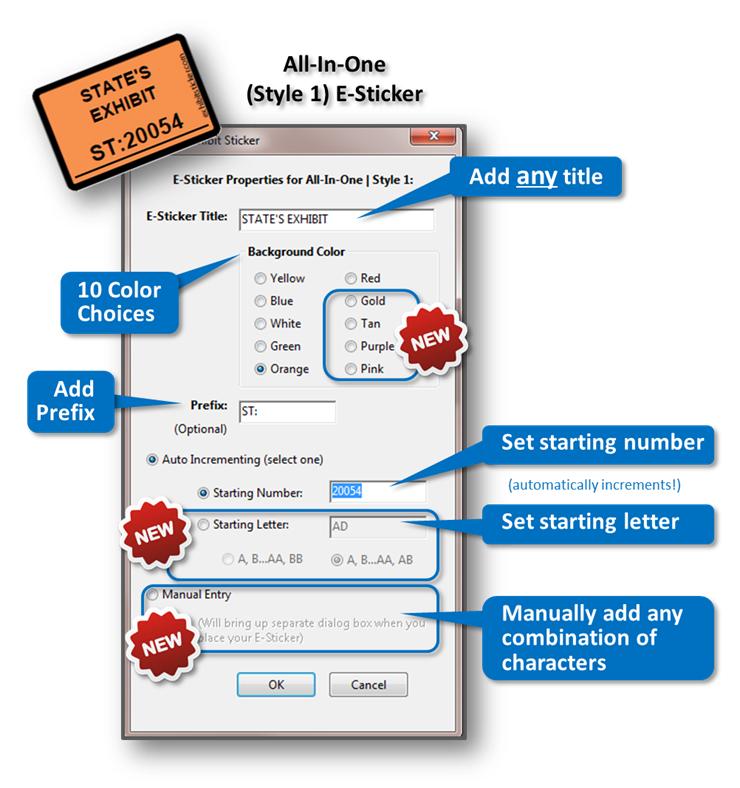 Powerful features, such as the ability to auto-number or letter, make it very easy to digitally exhibit sticker PDFs. Set your starting number or letter, choose your E-Sticker (or us the quick “k” key short cut) and with the click of your mouse you have placed your E-Sticker. When you open your next document the E-Sticker remembers the last number/letter you used and automatically increments to the next number or letter making it simple and convenient to E-Sticker all your PDF files. 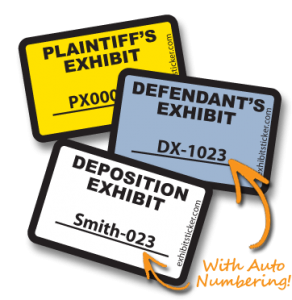 You can even use the E-Sticker to add blank labels to your PDFs to prep for depositions. 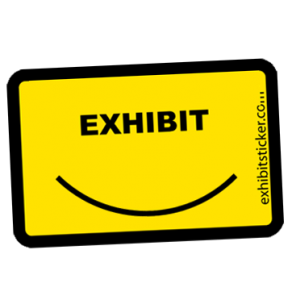 ExhibitSticker.com is a subsidiary of The Exhibit Company. For over 20+ years, The Exhibit Company has been providing visual consulting services, presentation design and in-trial support for litigators across the country. One of our oldest and dearest clients, Kathy, called us in a panic one afternoon. She was the paralegal on a very large and deadlines fast approaching. She was looking for a digital solution to help her exhibit label over a thousand documents over the weekend. That was the birth of the first E-Sticker. We developed a prototype digital E-Sticker solution that saved her client over $1,000 (or more) and saved her precious time which she didn’t have to spare. Since that time, we’ve improved the E-Sticker to be even faster and easier to use. (labor cost incurred + frustration + time). That’s it. Two steps instead of six, countless hours of time saved and no outsourcing costs. All for the price of a billable hour…if that. And…with the batcher, it is even faster…one click you are done. Because the batcher is so powerful, we only provide it upon request. Need to Upgrade to a DC E-Sticker? If your firm has switched to the new Adobe Acrobat DC platform, great news! Our legacy customers can upgrade for 50% off. Contact us through the contact form to receive your upgrade coupon. If you are a new E-Sticker user all E-Stickers are DC ready.